The Contempo range of clinical pendants and accessories, provide high quality, premium grade, Class 2 B medical storage solutions which improve space, accessibility and supply of services in hospitals. These modular, flexible and user-friendly ceiling-mount clinical pendants form part of Bender UK’s extensive turnkey healthcare solutions and can also be supplied separately. 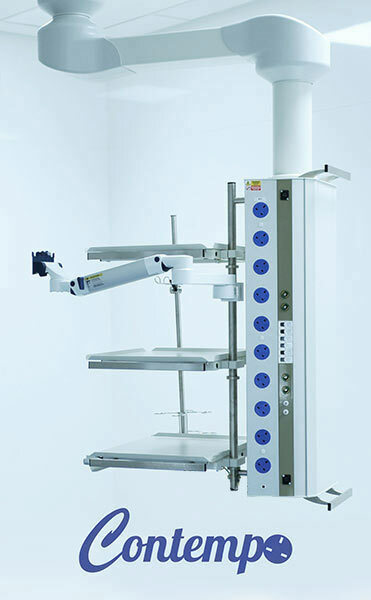 This comprehensive range includes fixed, single, dual arm and tandem configurations with either multimovement and articulating arms. They provide an effective central supply of gas, data outlets, electrical sockets and a range of accessories that can be constructed to customised specifications. Bender Contempo pendants have been designed with the patient’s safety in mind, to help reduce the spread of harmful bacteria and potential infection. Ceiling mount fixed pendants, flexible, user-friendly and high-quality. Ceiling mount pendants in multiple configurations to optimise theatre workspace. Enhanced reach and rotation with single arm pendants. Highly adaptable dual arm pendants for increased flexibility and movement.